Made with high quality CNC Machined Aluminum, our 17/23mm wrench is a must for serious nitro 1/8th scale truggy and Monster Truck racers. With the popularity of 1/2 “ offset truggy rims (used on Jammin CRT, Losi 8IGHT-T, the new Kyosho ST-RR) we lengthen the neck of the 17mm wrench side to reach into the deeper offset rims while still providing enough room between the handle cross-bar and the wheel for your fingers to get a good grip (and still works great for 0 offset rims and 1/8th buggy rims as well). The handle cross-bar features a 8mm wrench that is perfect for axle lock nut of Monster Truck owners (Traxxas Revo, T-Maxx, HPI Savage…etc. ), and the handle cross-bar is adjustable in length with a simple turn of an installed set screw. The cross bar also features a 5mm hex wrench size that is prefect for removing the plastic pivot ball cups on your Traxxas Revo Truck. 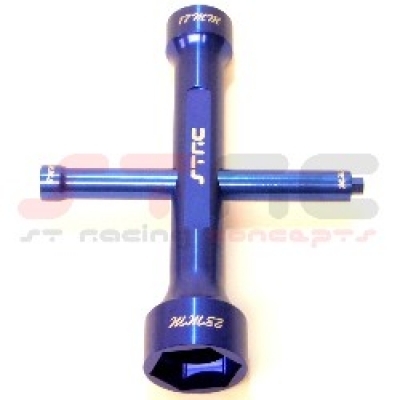 While there are many 17/23mm wrench tools on the market, few carries the same innovation, adjustability and most important, the quality that the ST Racing Team Tools offers.